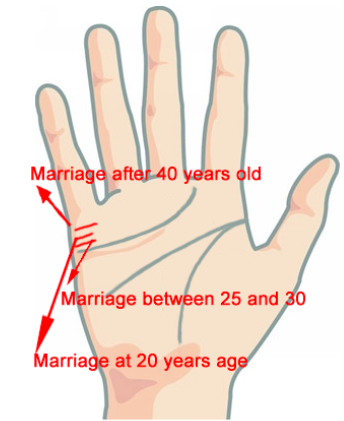 In palmistry, three points are checked for marriage and marriage related matters. First line is under little finger. It is known as marriage line. Second thought can be decided through Venus and Moon mountains. Third decision can be decided through Jupiter Mountain. The condition of marriage line and mountain avoids problems relating to marriage. Marriage Line: If the marriage line is clean and clear then one easily get marry and get happiness in marriage. The improper marriage line indicates problem in getting married and happiness in marriage. If marriage line broken then there might be separation in marriage. If it goes downward then one gets delay in marriage and there won’t be happiness in marriage life. If marriage line goes on Sun mountain or it has mole on it then there would be drop in life after marriage. Venus, Moon & Jupiter Mountain: The net or star on Venus mountain indicates diffuse in marriage. One gets delay in marriage if there is mole or spots on Moon Mountain. These two mountains indicate marriage. When the marriage time is near then Venus and Moon Mountain becomes pink. The small line goes upward. If there is cross on Jupiter Mountain or there is relation with luck or life line then a person does love marriage. Problem: Wear pure silver ring in little finger if marriage line indicates problem in marriage. If marriage line indicates delay in marriage then wear ring which is mixture of gold and silver in little finger. If there is negative sign on Venus Mountain then apply sandalwood on Shivaling. Also, worship lord Shiva. If Moon Mountain creates problem in getting marry or marriage life then keep fast on full moon day and offer water to Moon. Good Luck: Do not keep mirror on head or leg in bed room. It increases loneliness in life.